Travel in luxury with soft-yet-supportive memory foam + our patented ergonomic design. Tired of Travel Pillows That Just Don’t Work? Experience the next evolution in sleep on-the-go. 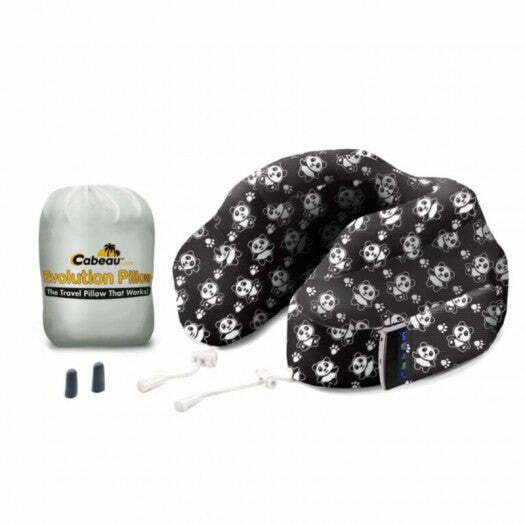 Responsive memory foam and 360° head + neck support make the Evolution® Pillow the most comfortable travel pillow on the market. Say goodbye to sleepless flights. you’ll feel like you’re sleeping on a cloud. Patented Ergonomic Design : The flat back portion of the pillow conforms to your neck, and won’t push your head forward. Find Your ‘Support Spot’ : Adjust for the perfect 360° support, whether your head leans left, right or tends to fall forward. Shrinks to ¼ the Size for Easy Storage : Our deluxe travel case compacts the pillow to ¼ its size for quick + convenient packing. Memory Foam Earplugs : Block out the sound of your neighbor snoring + other ambient noise for more restful sleep. *Please leave your Evolution travel pillow uncompressed and outside its travel bag when in long term storage.